Speedy Delivery by Paul Germain '04 was honored this month (February 2009) as Best Feature Film at the Children's Film Festival Seattle. Previously, Speedy Delivery won the Audience Choice Award at the Feel Good Film Festival in Hollywood. It aired on PBS regionally last fall... Read the full article. Speedy Delivery Wins Best Feature Film! The Children's Film Festival Seattle has chosen Speedy Delivery as the winner of the Children's Jury Award for Best Feature Film. Read the full article. 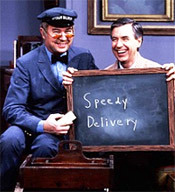 [David] Newell will bring Mr. McFeely to Seattle this weekend for the premiere of Speedy Delivery, a documentary by Los Angeles director Paul Germain. The film will be shown at the fourth annual Children's Film Festival Seattle, sponsored by the Northwest Film Forum. It's a touchy thing, letting kids see the man behind a character they have known and loved for decades. But in following Newell and his alter ego on film, Germain captures his efforts to keep the Neighborhood current against a constant tide of newer, faster children's programming, and other endless diversions... Read the full article. The 4th Annual Children's Film Festival Seattle will showcase 86 films (features and shorts) from 25 countries, including a documentary on a beloved character from children's television... Read the full article. Undoubtedly countless numbers of readers of this paper and their children and grandchildren grew up hearing the words, "speedy delivery, speedy delivery" coming out of their television sets each day via the PBS program "Mr. Rogers' Neighborhood." ... Read the full article. Speedy Delivery now has its very own IMDB entry. We're excited that our own David Newell is the subject of a feature-length documentary exploring his life and his experience as the much-loved character of "Mr. McFeely" known also as Speedy Delivery. This endearing tribute explores David's working relationship with Fred Rogers on-camera as "Mr. McFeely" over four decades and off-camera as Director of Public Relations for Family Communications, Inc... Read the full article. Filmmaker Paul Germain was raised on the Mister Rogers of the 1980s. The neighborhood was familiar and gentle, he remembered. "I felt like I was hanging out at my grandpa's house." When Germain met David Newell in the fall of 2005, he knew within minutes that he had found his new documentary project... Read the full article. When Paul Germain was a toddler, the kids-TV world was filled with booms and bangs... Read the full article. "Speedy Delivery," directed by Paul Germain won the prize package and closed the festival on Sunday evening to grand applause... Read the full article. The last new episode of Mr. Rogers' Neighborhood aired in 2001, and its namesake star has since died. So it might seem that the feel-good educational show, which debuted in 1968, is well into its twilight years. But Stuart Friedel '08 is helping to keep the Neighborhood alive as the producer of a new documentary, Speedy Delivery... Read the full article. When Paul Germain says Speedy Delivery was done on favors, he's not kidding. That's the only way you can make a 75-minute documentary (and a fine one, at that) on $4,000, with most of that money going to equipment and two tanks of gas. 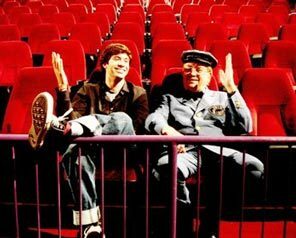 Speedy Delivery, premiering tomorrow at 8 p.m. at the Regent Square Theater in Edgewood, looks at David Newell, the Pittsburgher who has played Mr. McFeely... Read the full article. The television show Mister Rogers' Neighborhood was a big part of my childhood. Not only did I watch the show for years, but I grew up in Pittsburgh, the hometown of the show. Mr. McFeely (David Newell), along with other members of the cast, appeared at countless functions during my childhood. Having met the man who made the famous speedy deliveries at least five times, I was more than willing to attend Lafayette's viewing of Paul Germain's '04 documentary, Speedy Delivery.